Below is the list of nominees for the Puzzle App Games of the Year awards, known around the world as the famous PAGY Awards. It's very possible that there were other worthy puzzles that are not on this list. 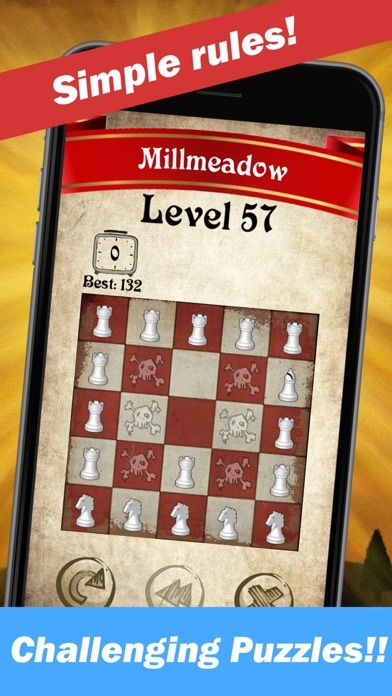 Every week there are approximately 200 new games published on the App Store with a classification of 'puzzle'. It's impossible to scrutinize them all. But we did our best. 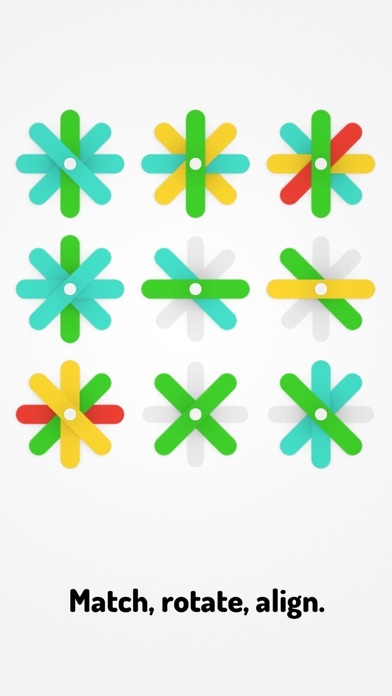 If you know of a great puzzle app that was overlooked: let us know in the comments section below. Tomorrow, I will post the 2017 PAGY winners. 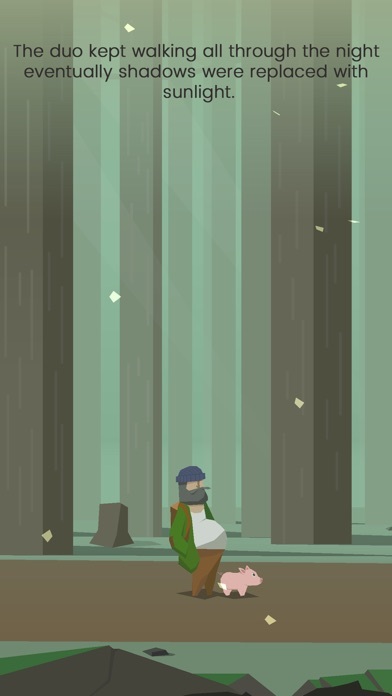 When Maciej Targoni publishes a game, of course it's going to be wonderful. 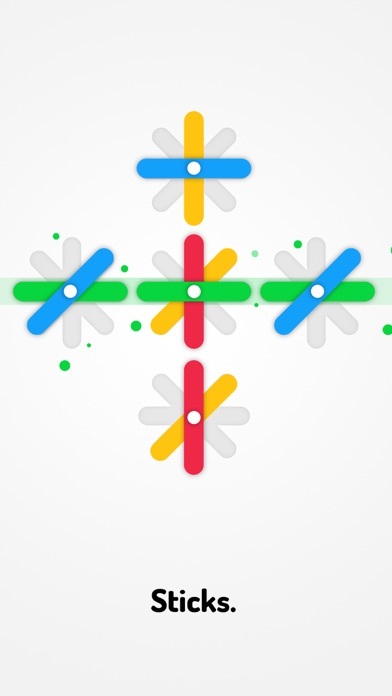 "PUSH" is Maciej's newest game. He and Michal Pawlowski made it together. Maciej's other games are at the bottom. I've been meaning to play test this game for about 2 months. Back then, I solved the first 7 or 8 levels and realized that I might need to take notes about all the features. The object is to push all the buttons in the down position. Nothing is explained. Everything is self-discovery. Every level has an 'aha' where you must discover what the correct pattern is. Today I gave it a go for about 90 minutes. I'm somewhere about level 45. No idea how many levels there are. I'll finish them tonight. "PUSH" is featured by the editors of the App Store. Deservedly. Update 12/30/17: I finished the game. There are 65 levels plus one spelling puzzle at the end. Other games from Maciej that you must download. The annual PAGY Awards are fast approaching. 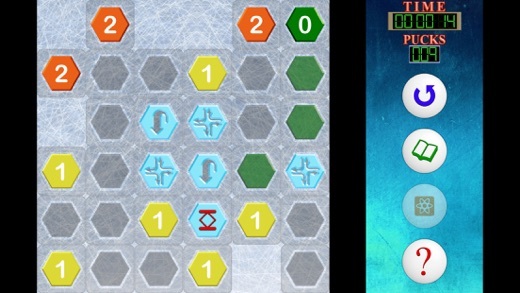 Each year, I nominate the best Puzzle App Games of the Year on December 30. The winners will be named December 31. Note: the PAGY Awards are very subjective. (Just like the Oscars, the Grammys and the Pulitzers.) The first purpose is to draw more people to the joy of puzzles. The second is to recognize the indie gamers who put forth their best creative efforts. Sadly, many of these games are unprofitable. It's the elephant in the room. But we hope they continue. To be sure, I have play tested every single game thoroughly. A constant regret of mine: overlooking a puzzle. If I've missed a worthy game, send me a note, and I'll include it for 2018. 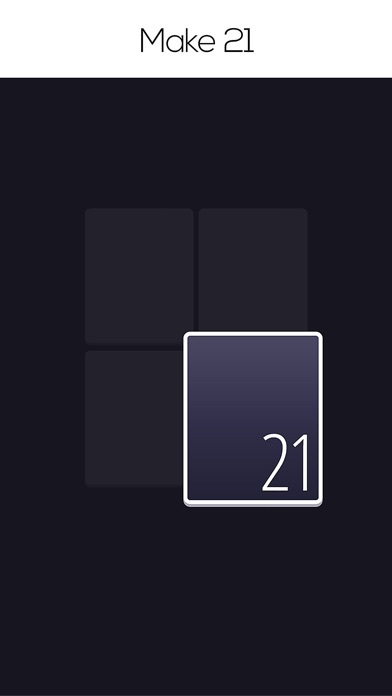 21 Black comes from Bit Free Games. 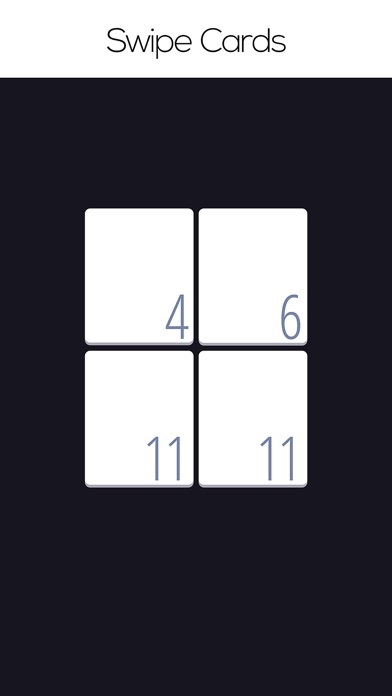 The object is to score points by combining adjacent tiles to make 21. Two identical tiles never add when they merge. Two 6's will yield one 6. I've played the endless mode. This is an interesting game. The idea is great. The graphics are very good. Where 21 Black falls short: if played perfectly, you'll never lose. You can even make a lot of mistakes and easily overcome them. I stopped at 1000 points and then intentionally lost. Another problem: the program does not always save your game mid stream. 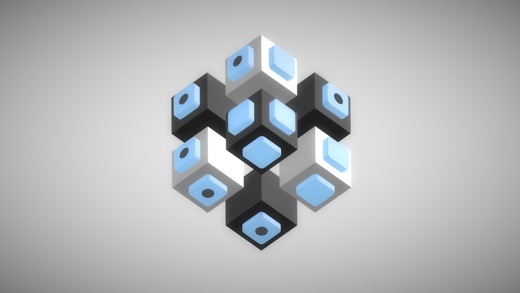 QB - a cube's tale comes from Stephan Goebel. 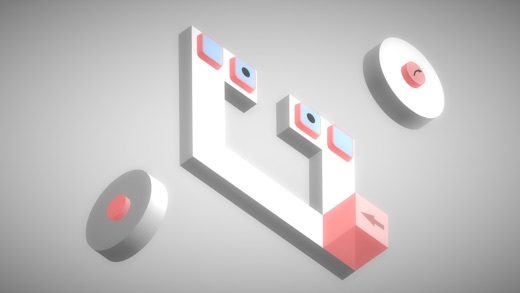 It's a maze game with obstacles. The object is to get Your Man, the black cube, to the black square. 1. Landing on a red square will destroy the square immediately forward. It matters whence you land on it. 2. 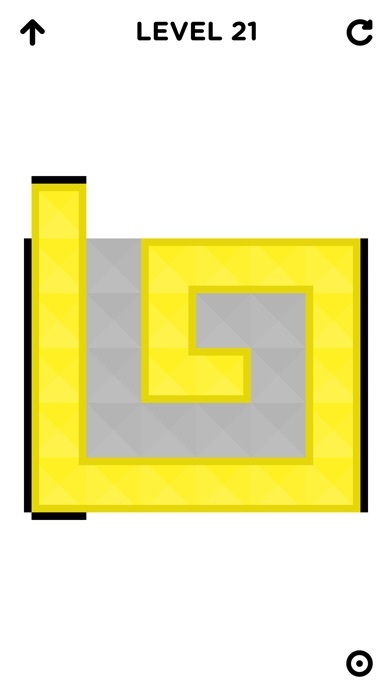 The yellow towers must always be destroyed, by landing on a yellow square, which will fire a laser. Again, landing on the yellow square from the correct orientation is critical. 3. 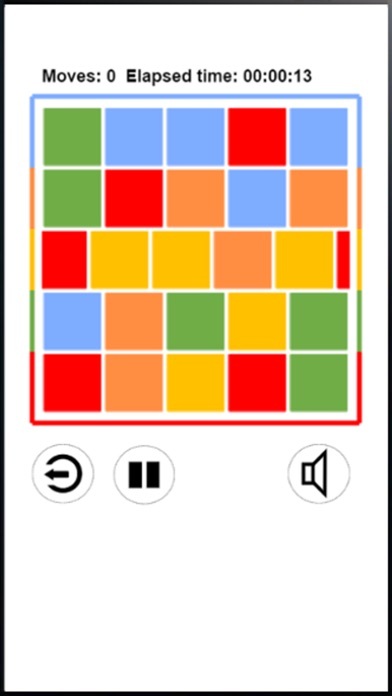 The blue squares enable you to jump 1 square. 4. The little black squares indicate that Your Man can only traverse that space once. 5. 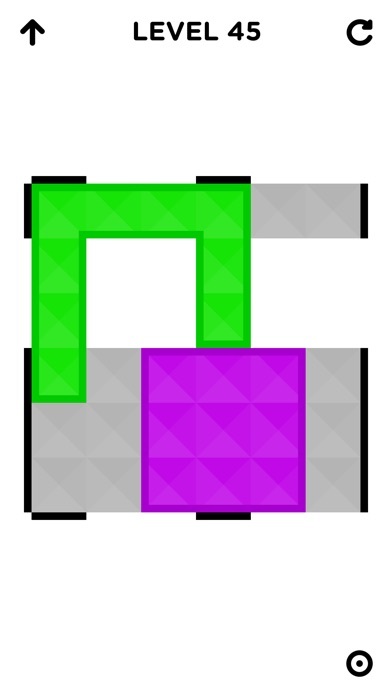 The green square: the forward and back squares will swap places. Very cool. 6. 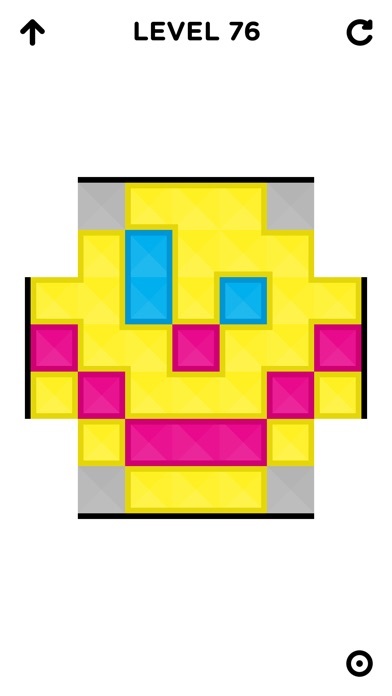 Not shown in these images: red/blue, red/yellow and blue/yellow squares. 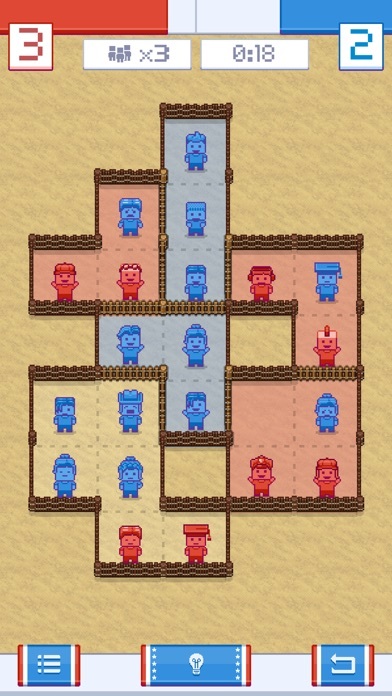 If Your Man lands on a red/blue square with red being up and blue down, it will act as a red piece. But will then flip upside down to act as blue the next time. 7. The green, white & black squares slide 1 space. They show up in the last 10 levels. 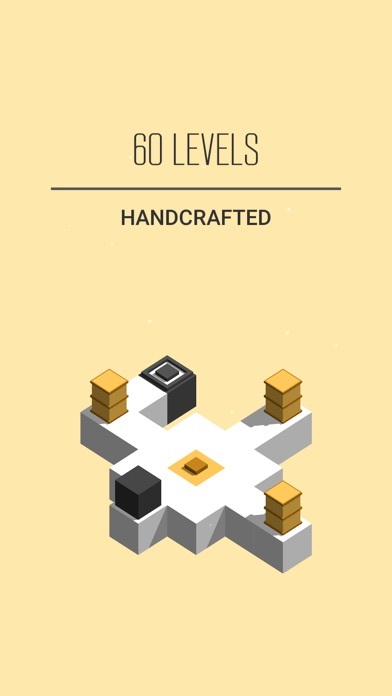 There are 60 levels (a perfect number!). There's a lot of trial and error. Some good 'aha' moments. It took 3-4 hours, but I solved them all. 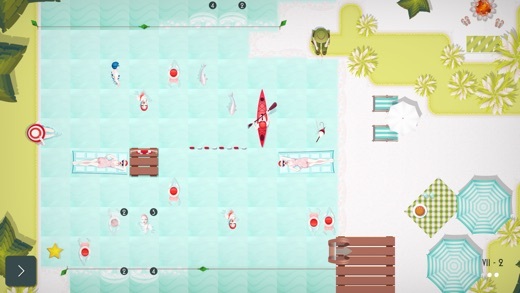 Mat Lozinguez contacted me back in August about his game Swim Out. He and his wife Ava are the team behind Lozange Lab. 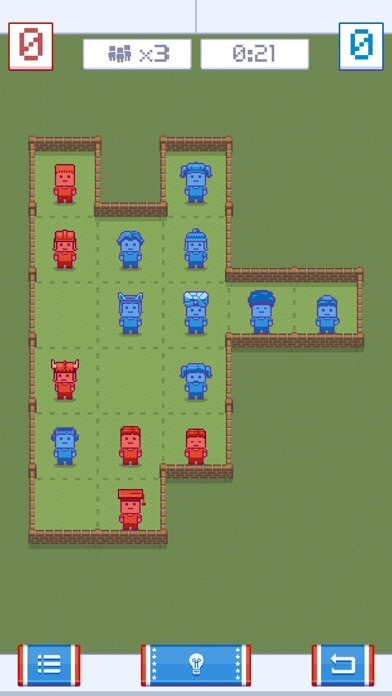 The object is to get the swimmer with the blue cap to the ladder without crashing into any of the swimmers with the red caps. 1. 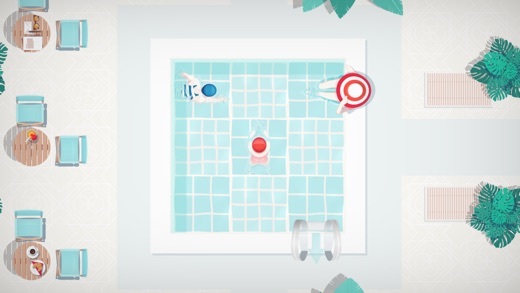 For some levels, you must retrieve an object that will temporarily halt another swimmer. 2. Most of the swimmers do simple back and forth laps. Unless there are 45 degree angle walls which force a 90 degree turn. 3. Avoid the ladies who sit with their legs in the pool. 4. 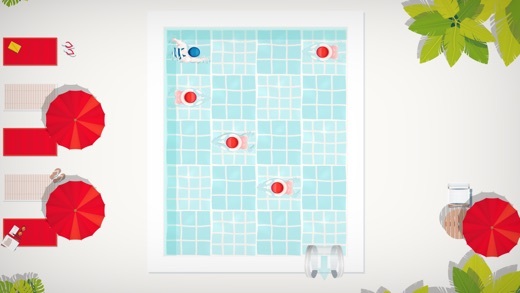 Blue Boards: for those who can't swim, these 'swimmers' take up 2 square units. 5. Boomerangs, kayaks and too many other things like waves, divers, and fins. There are 115 levels. I love the graphics. The puzzles are challenging. Lots of trial and error. I've done about one-fourth of the levels. Shuttle Shuffle is their old game, which I reviewed almost 3 years ago. follow.trail comes from Grzegorz Pykacz, originally from Poland, but now in Canada. The object is to get Your Man, the blue square, to pass over all the white squares and finally land on the checker board square. Essentially, it's a maze game. 1. The white squares must be traversed based on how many dots appear. 2. The swirls are wormholes. 3. 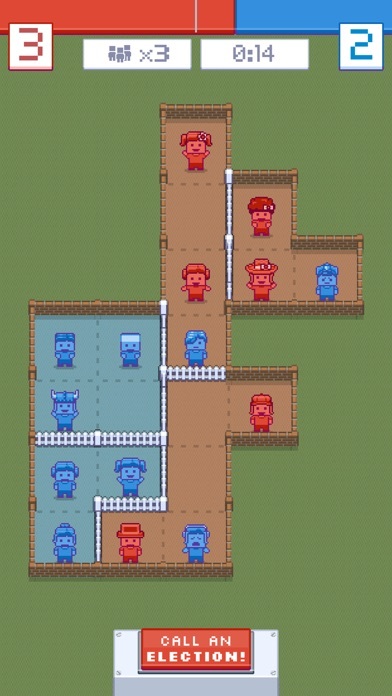 At times, Your Man, must cross onto the red grid. When this happens, new black squares emerge. 4. Your Man, must land on the Sun. 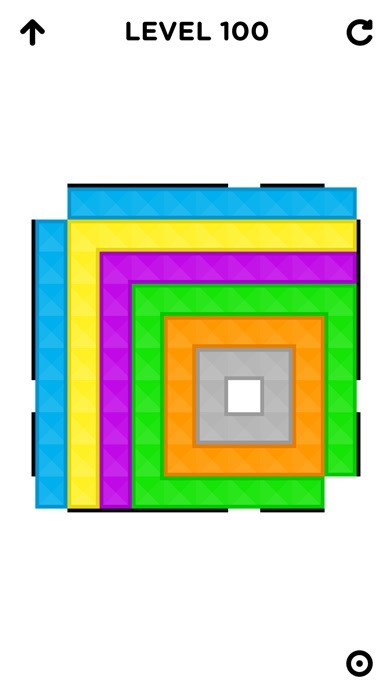 This will reverse the white & black squares. 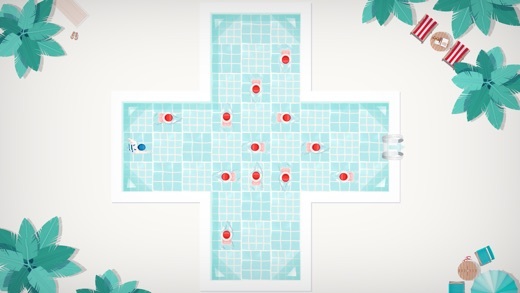 Since the Sun can only be landed on once, eliminate all the white squares first. 5. Your man can drift off the grid to the right, and will land on the extreme left edge. Same for the top/bottom edges. 6. Are there levels with multiple Suns? 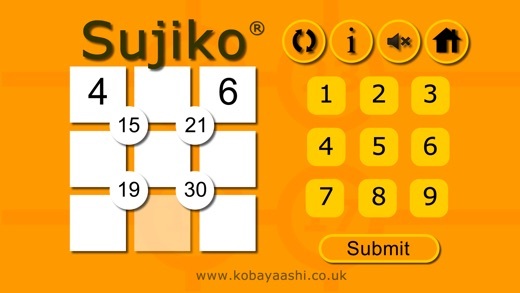 According to the Leaderboard, 'znonymous' is #1 and has solved 1,111 levels. 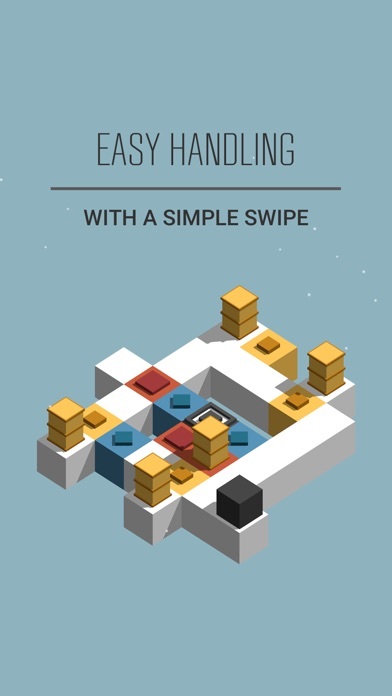 That's incredible, because I'm finding that there's a lot of trial and error and each level can take 15 minutes. I've only solved 34 levels. There are 358 players on the Leaderboard. 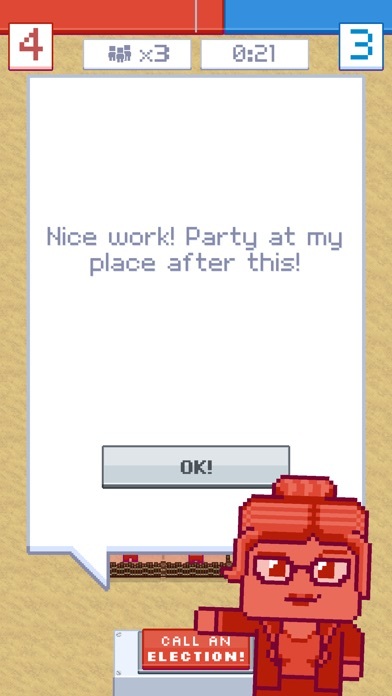 This game is definitely worthy of your time. Sticks. comes from Kamil Kucma. 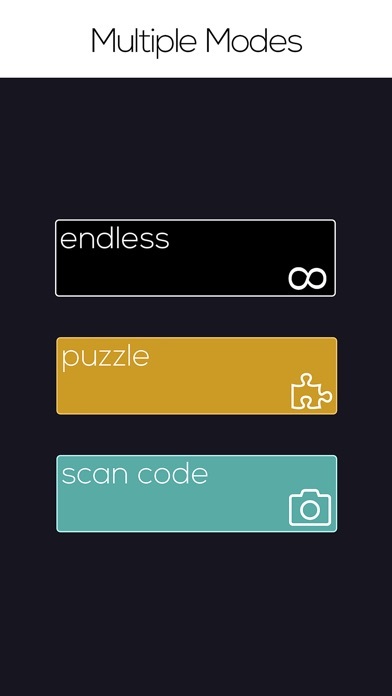 It's a point scoring puzzle app. 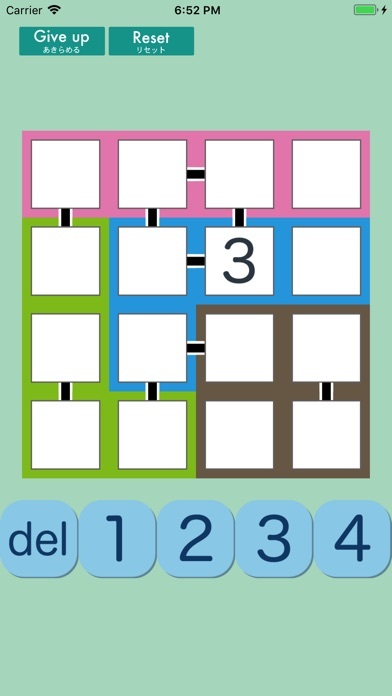 You are given 3 tiles at time to place within the grid. At all times, everything can swivel. Match up 3 in any direction, score points and keep going. I've only played this game twice. The second time was this morning and I was still alive, but had to go to work. I think this is a very solid point scoring game. I like the graphics a lot. Gerrymander: Rig the Election comes from Good Egg Games. The object is is draw some lines so that each group has an equal number of people and that your political party will prevail in a majority of the regions. Note to Puzzlers not in America: every 10 years the United States does a census. The purpose of this is to reallocate the number of representatives to the House of Representatives. Let's say New York needs to lose 1 seat while Texas gains a seat. The government in each state will then redraw the district lines. Theoretically, this would be done logically. However, some democrats and republicans will be very craft to ensure that their party wins a majority. The origin of the term Gerrymandering is also interesting. See the link for the other game Districts. I've solved about 15 levels. It's okay. Districts is very similar and came out earlier this year. From those we get that D - B = 4. There are only 2 possibilities: B = 1 while D = 5 and B = 3 while D = 7. We plug them in and go from there. I don't think the image above is solve-able. The 30 should be surrounded by 6, 7, 8 & 9, and 6 is already used. Below are the rules and the links to 2 versions of this game, made by the same people. 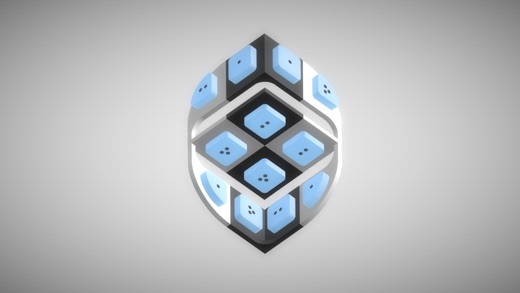 The playboard is composed of a 3 x 3 grid, with four circular spaces at the internal intersecting nodes of the grid. 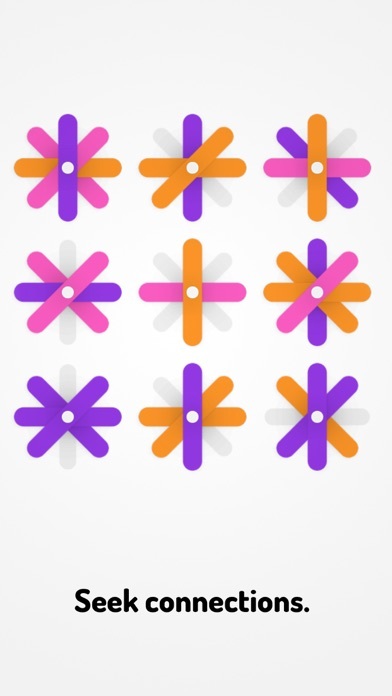 The objective is to "Place the numbers 1 to 9 in the spaces so that the number in each circle is equal to the sum of the four surrounding spaces." 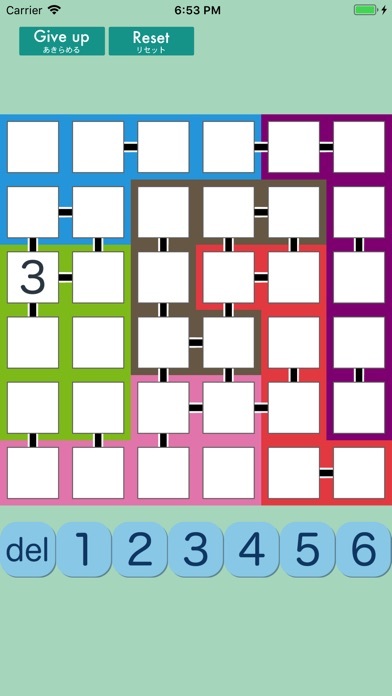 At least one number in the grid is filled in on most examples to ensure that each puzzle has only one possible solution. 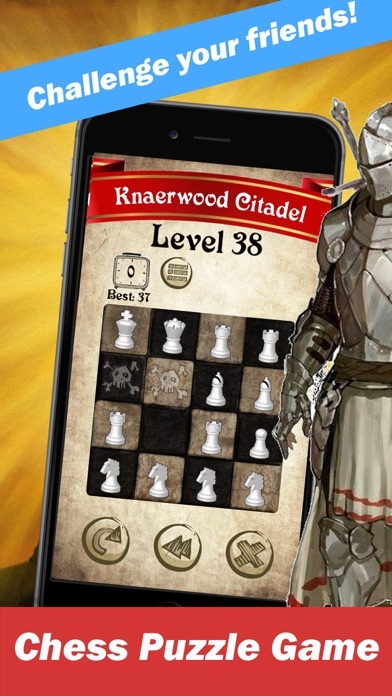 It's been a while since we've played a new chess app game. Knights comes fromHikari Sasu. 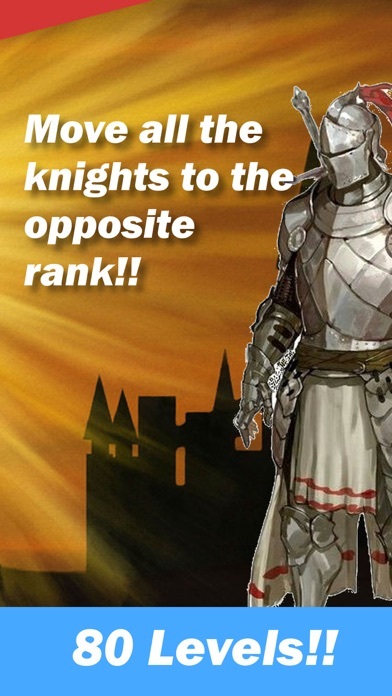 The object is to move all the knights from the bottom to the top. No capturing is allowed. Interesting: some squares are 'no go'. No piece land on them, or pass over them. The puzzles start out pretty easy with all the other pieces being just rooks. 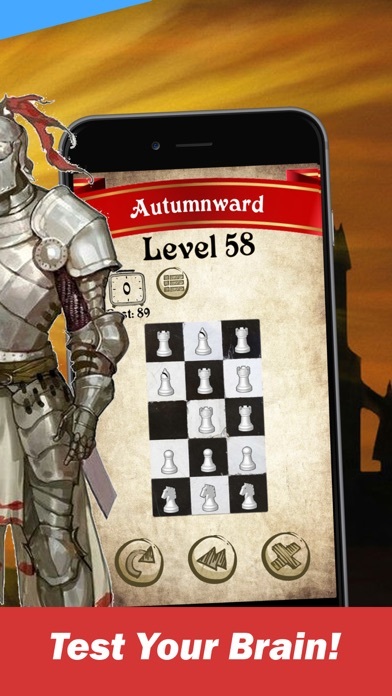 The difficulty rises at level 16 when a pawn is introduced. It can go up, and never down. The graphics could be a lot better. The user interface is clunky: it's slow and does not record the number of moves. Still, I was sufficiently frustrated by the puzzles themselves: they require careful consideration. Waltzing Tiles comes from Boris Sokolsky. The object is to slide the rows/columns back/forth and up/down to un-mix the colors. The easy mode is way too easy. We've seen this type of puzzle way too often. 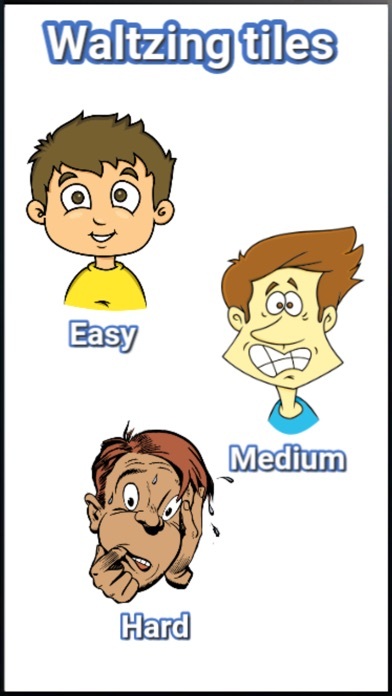 The medium mode is slightly harder. 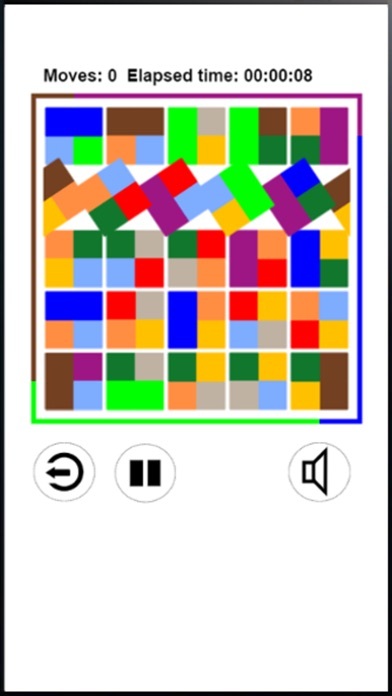 Each tile has either 3 or 4 colors. The hard mode is fantastic. And very hard. 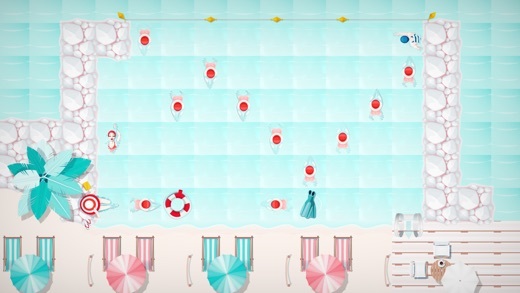 As you slide a row across, each tile rotates 90 degrees. So there are 2 tasks: solving for the position of each tile and the orientation. I've tried it only once and ran out of moves. DropPocket FV comes from miho ito. The object is to fill up all the spaces with tiles from the piles that have numbers on them. Slide them vertically/horizontally. I think the directions from the App Store came from a translator. 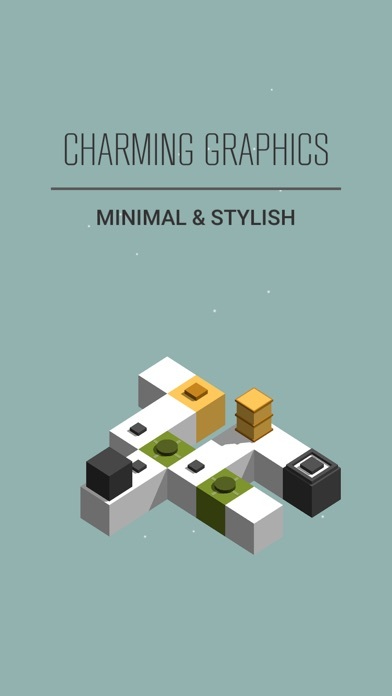 It is a game that buries six stroke packing under all ditches. Packing begins to move by the automatic operation in that direction when the slide is done. The direction is changed, and packing jumps when it passes the sign. The figure of packing is a number of packing. The ditch is sequentially buried only in the number of figures by packing in the operation of one degree. If packing goes out outside the room or it undertakes the packing that cannot be passed, it becomes a re-doing. To collect the packing moved once, it ..packing of "0".. touches. The kind of the game is increased at any time, and look forward, please. The first 30 puzzles go very fast. Then some interesting elements are added. Curved arrows change direction. The 'go back' arrow sends you in reverse. Look at the first image. 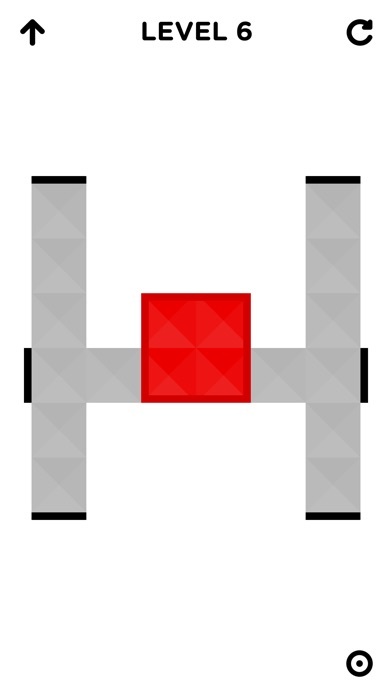 See the tile with the red symbol. It's surrounded by 1's on the left/right/bottom. If the 1 at the bottom passes over it going up, it will be enabled to pass over the tile with a 1 on it. Normally, this would be an illegal move. I started Disjoint about a month ago. The object is to swivel triangles around each other on various pivot points so that all the triangles will fill up the shaded areas. Some triangles are isolated. They have to be rescued in a chain-like way. Then I forgot about this game. It's hard to get back into a game when so many new games are getting published every week. There's a lot going for this game. The puzzles are clever. The graphics are crisp and clean. 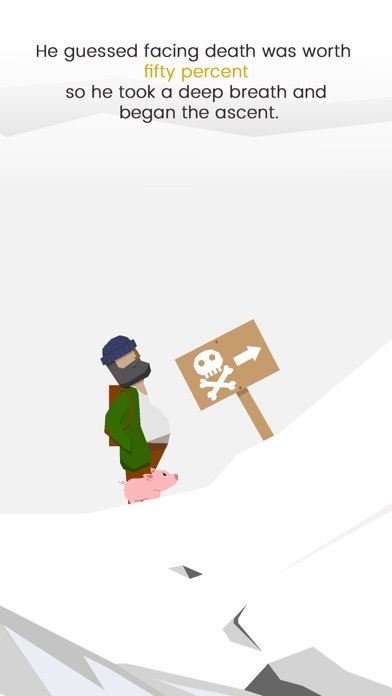 After each chapter there is a picture story about a pig and a man looking for wisdom. 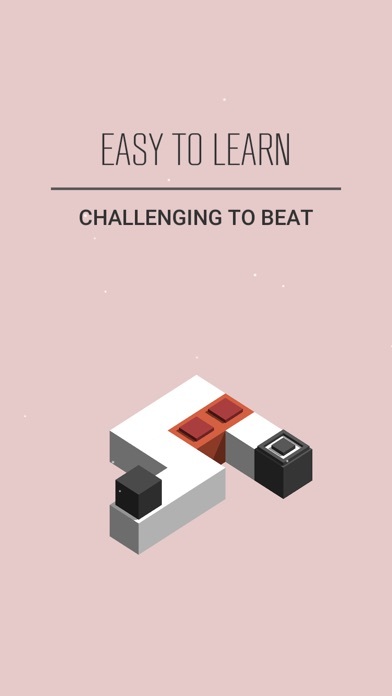 I've completed the first 2 chapters, which totals 24 levels, I think. I'm definitely coming back to this game. This game needs more attention. 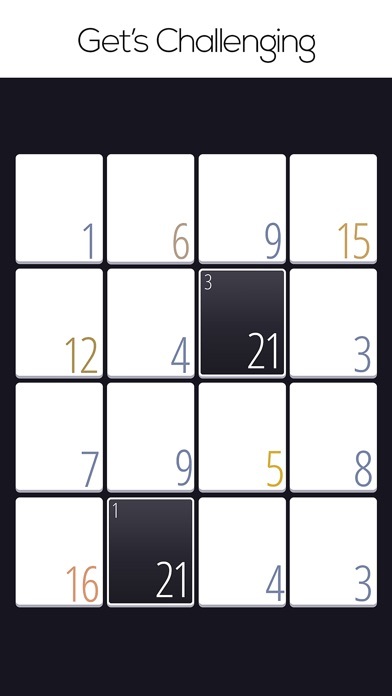 Which reminds me, I have to get going on the famous PAGY (Puzzle App Games of the Year) Awards. The nominations will be December 30. The Finalists will be December 31.
https://www.youtube.com/watch?v=B5p2A5mazEs&sns=em Amazing spirals & sculptures. John Edmark is a genius. https://www.youtube.com/watch?v=NqJC3YxfcyM&sns=em Do you recall my mentioning Oskar van Deventer's world breaking 17x17x17 cube? That was almost 7 years ago. Greg Pfennig has created a 33x33x33 cube. Definitely check out his other twisty videos. Joint Number Place comes from Yuki Fujimoto. 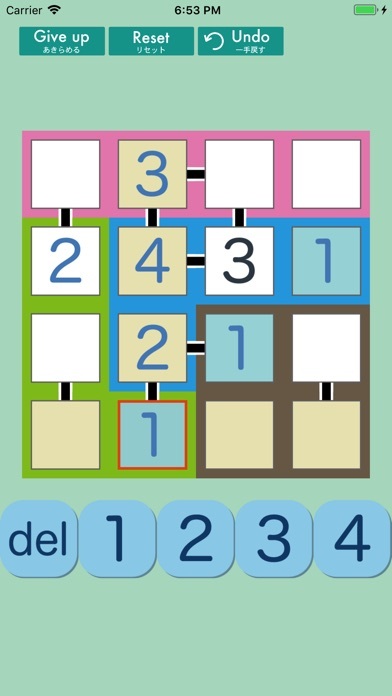 The object is to form a Latin Square such that: each row and column has numbers 1-n. Also, each colored area has numbers 1-n.
Each black line connects consecutive numbers x and x + 1. 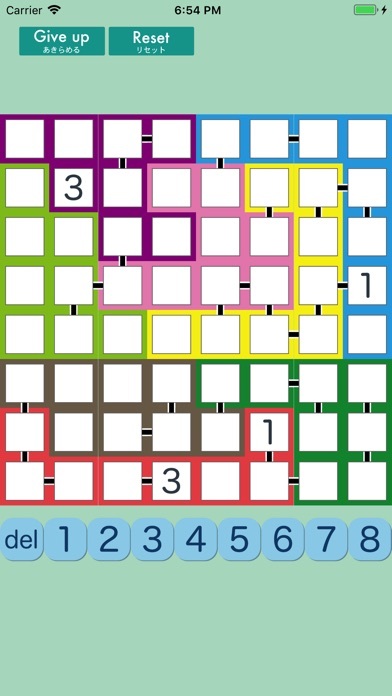 Kropk'i Sudoku (see link below) had a similar feature. 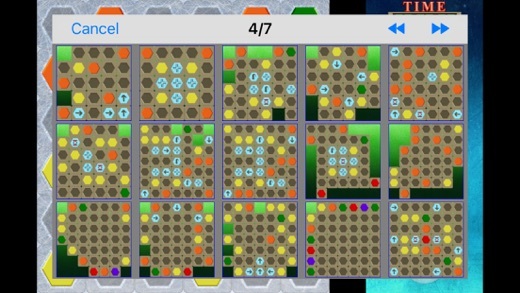 There are 25 levels in each grid size from 4x4 through 9x9. 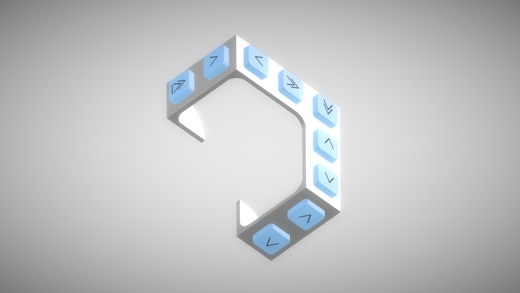 These puzzles are fun and challenging. I've solved all the 4x4's, half the 5x5's and some 6x6's. I tried the 9x9's: no progress - yet. The graphics for Joint Number Place are overdone. There should be no white or tan squares. The background should be black. The connecting lines should not have two colors. These are minor complaints. 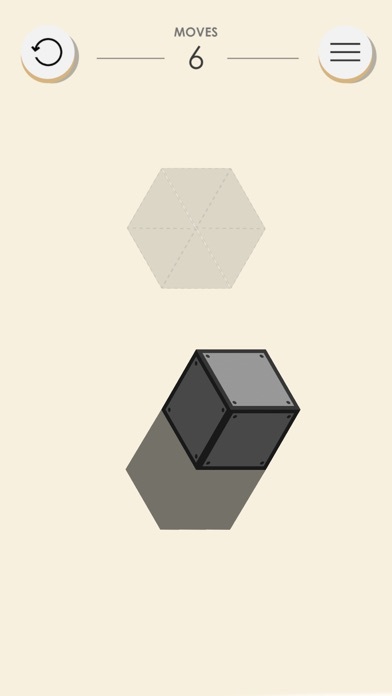 Flat Cubes: a 2D Rubik's Cube comes from Christophe Scholly. 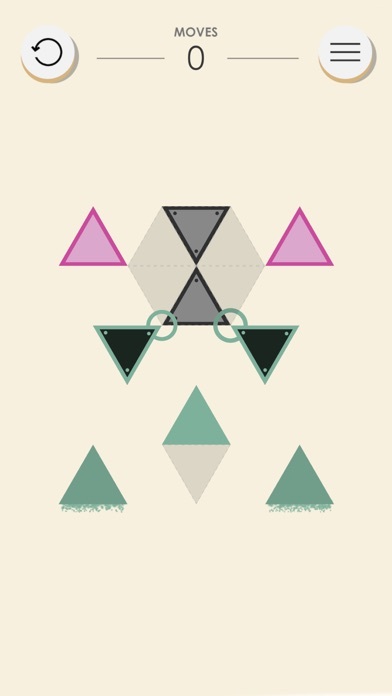 How many times have we seen puzzles described as a 2-dimensional Rubik's Cube? 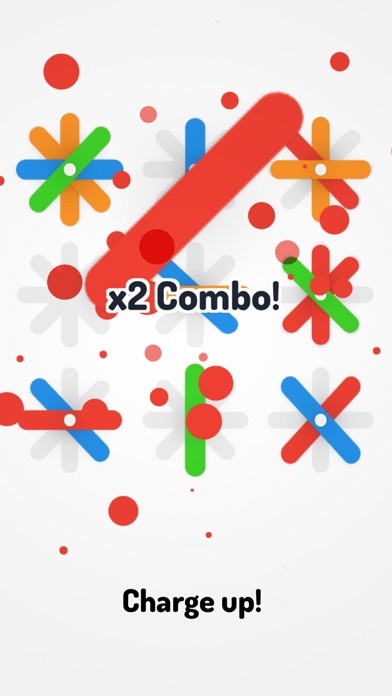 The object is to slide/transfer the colored tiles onto their targets. Interesting: not all the rows/columns can slide. Only the ones that have the black borders can slide. There are 100 levels and I solved the first 25 in about 30 minutes. Last night I solved the next 40 levels in about 45 minutes. If you've never done this type of puzzle, then definitely give this a chance. The graphics are really very polished.